In the Haitian capital's first major opposition rally since the devastating January 12th earthquake, protesters demanded Monday that President Rene Preval step down. Angry demonstrators marched several miles from Cite Soleil, the capital's poorest area, to the destroyed Presidential Palace, calling for the reinstatement of exiled leader Jean-Bertrand Aristide. 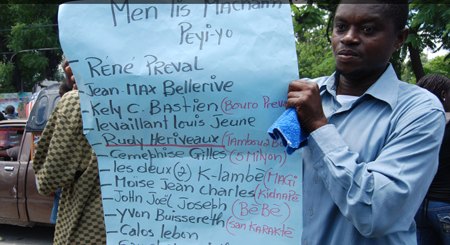 Many were affiliated with Famni Lavalas, the populist party run by Aristide. More than one thousand opposition supporters mobilized, carrying pictures of Aristide and accusing the current president of selling out to foreigners with a quake relief deal that promises $10 billion over 10 years. On Friday, the Haitian parliament approved a decision by Preval to stay in power until May 14, 2011, in the event that a successor is not elected and sworn in by February 7, 2011. Signaling mounting frustration with the slow pace of relief efforts, one protester said Preval is complicit with George W. Bush -- and even Barack Obama -- in robbing the Haitian people. The protest was a mix of festive dancing and furious chants. Anti-imperialist and anti-white slogans were common, and demonstrators called for an end to the foreign troop presence. As Monday's march made its way through Cite Soleil, unknown gunmen fired shots into the air, after which marchers urged reluctant police to "track down those responsible." Bystanders claimed that the shots were to signify the Haitian people's latent firepower but not to incite violence. But Reuters reported that the demonstrations were accompanied by assaults and muggings of passersby. Several different divisions of the Haitian police provided security during the march, accompanied by UN peacekeepers from Brazil. As protesters neared the city center, Haitian police and French UN peacekeepers surrounded the collapsed Presidential Palace. Police then shot tear gas at protesters, allegedly after university students threw rocks toward the police. The AP reported similar protests in other Haitian cities on Monday and quoted Port-au-Prince protesters who promised to resume demonstrations on Tuesday. 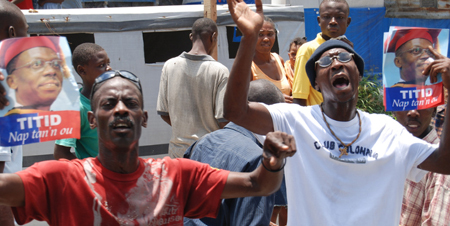 A similar protest by pro-Aristide Lavalas supporters occurred last week in the southern city of Jacmel.